The wedding was in the garden of a villa by the Nile. I was staying at my friend Leyla’s rented apartment in Giza, the suburb of Cairo which is out in the same area as the great pyramids. Every summer Leyla, a California belly dance instructor, would attend the famous Ahlan Wa Sahlan Belly Dance Festival, as many other dancers do from all over the world. But Leyla would, every year, spend an entire month in that lively, ancient city. Ahmed had been her guide so long in Cairo that he had become a good friend. Through him she came to know his family well, and ended up visiting many parts of Cairo that the usual western visitor never sees. Several different summers, I had spent a week with her there, in the apartment in Giza which Ahmed rented for her, and I always loved my visits with her. From the balcony of the apartment one could see the colorful vegetable market, all the shops, and the mosque on the corner, which the neighborhood residents had all contributed to, building a new story onto it whenever they could raise the money. The first time staying there I woke early in the morning and delighted in just watching the street, for hours. Before that I’d stayed in hotels, and had no chance to watch a local neighborhood. We always included a visit to the Café Darwiish, where wonderful musicians and singers played every Friday evening from after the evening prayer until midnight, the promenade on the edge of the Nile where Egyptians strolled, a ride in a felucca or in a party boat, and hanging out at the Khan el Khalili souq until early hours of the morning. The day after I flew in, Leyla said, “We have a special treat tonight, Ahmed is going to take us along to a friend’s daughter’s wedding!” I had seen wedding processions in the street, the groom and the bride (in her white western style gown) followed by a band of musicians and joyful, decked-out family members. In old movies and in new Egyptian TV series I had seen filmed fancy wedding receptions with uniformed bands, the bride and groom sitting on a dais and the many guests. Ahmed’s wife and their youngest son accompanied us on this evening, Ahmed driving the rented car which he always arranges for during Leyla’s visits. I was surprised when we turned off on what felt like a dirt road, the night darkness obscured where we were going but there were lights in the near distance. Some other cars were parked here and there in the dirt and grass outside a tall wall, through a large gate one could see lights and activity. We entered the walled back garden of one of the formerly grand villas, probably built in the 40’s or 50’s, which had been fitted up to rent out for events such as this. Along one end of the walled former garden of the villa, a wooden stage had been built, in several levels like a series of giant steps. A wide strip of steps ran up the center of this structure, to allow access to all the levels, and the fact that there were several levels gave the band which was playing a greater visual impact, as each musician could be completely visible. The music was highly rhythmic, without the beautiful nuances of the Egyptian music we’d heard either at the Café Darwiish or on the elegant stages of the ballrooms at the Ahlan Wa Sahlan Belly Dance festival. It seemed to be mostly drums such as the doumbek and the riff, and a man on a microphone who kept a patter going, keeping the crowd amped up while calling out names of the guests who brought up cash to donate to the newlyweds. Long tables were set up before this stage structure, and seated at these tables, or jumping up and calling to friends they caught sight of, or running from one table to another to greet friends and acquaintances; there was a great sense of excitement in the air. Most of these men were wearing the galabeya, the long shirt worn by many working-class Egyptian men. In a corner by the stage was an enclosure made by stringing up tall unbleached cotton drapes, from which tantalizing smells wafted. A parade of waiters, in casual jeans and shirts, carried out trays of roasted meat, vegetables, and Arab bread, and every guest was fed. Leyla and I and Ahmed’s wife Fa’iza sat at a little table a bit removed from the general crowd, and Ahmed and our host sat in chairs near to us. On the terrace of the villa, somewhat removed from the action, sat the bride and groom and the women of the host’s family. I wasn’t quite sure how to behave, as we were the only women down on the same level as all of the other guests. I noticed that Fa’iza was sitting proud and still and very reserved, so I followed her cue. I noticed that Leyla’s comportment was along the same lines. Usually Fa’iza is completely covered up in public, with a long dress and a headscarf which covers her neck and shoulders, but this evening, at Ahmed’s urging, she was wearing a fashionable headwrap and matching tunic/pants ensemble in a dressy fabric. 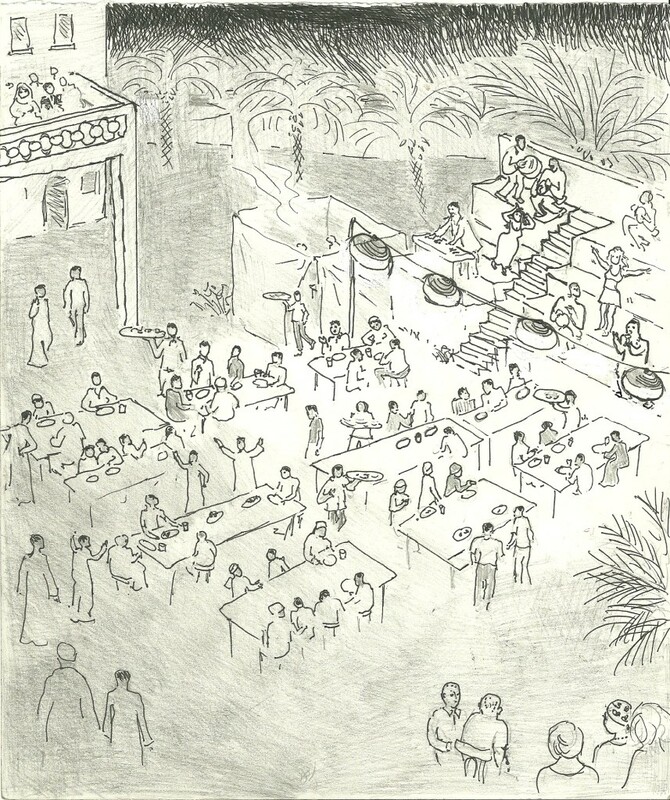 I asked Ahmed to ask Fa’iza why she did not choose to sit with the women of the family, up on the terrace, as there were no other Egyptian women down on the ground level. Ahmed explained that she chose to sit with us as she didn’t know any of those women. Only five years previous to this, Fa’iza had dressed in western clothes, even in public. But as more and more women in Cairo adapted the headscarf and long dress, she followed suit. Ahmed did not ask her to cover up, on the contrary; he wished that she would still dress as she had before. Our host was a merchant in the Khan el Khalili whom Ahmed had known and dealt with for years. Both he and Ahmed were wearing pressed shirts and slacks, and shined shoes. One of the waiters brought food to our table, and I found it delicious, especially the roast meat. There was a hush in the crowd when they became aware two young ladies, the dancers who were part of the featured entertainment, were making their way up the center aisle, wearing belted robes, moving with the drums in a measured, rhythmic walk, with the most absolutely blasé attitude, looking neither to the right nor to the left. The drumbeat seemed to get more insistent as the dancers made their way, every eye in the crowd upon them, to the middle level of the stage structure, where chairs were rushed to be placed for them to sit on, cigarettes offered to them, and those cigarettes theatrically lighted. For a while, the two young ladies sat and smoked, as if they were the most bored people in the world and had not a whit of an idea of all of the hungry eyes glued upon them. Then suddenly, the brown-haired one dramatically threw open one side of her belted robe, revealing the bra top beneath. There was a collective intake of breath from the crowd. Soon both dancers had shrugged out of their robes, and the robes and the chairs were carried off the stage structure. The black-haired dancer, who was actually a very elegant dancer, was wearing a long clinging gown, sleeveless and low-cut. The other girl wore only a bra top and a very short skirt, and had not much class as a dancer: basically all she could do was shimmy. Both seemed to be very enthusiastically received by the crowd. A man in a dingy galabeya and run-down “ship-ship” (that’s what Arabs call slip on sandals, because of the noise they make) mounted the steps of the stage structure and started showering the dancer with the long dress with money, the bills floating down all around her. Ahmed’s wife Fa’iza made a terse comment and her husband, her son and our host guffawed with laughter. “What did she say,” I asked Ahmed. He turned to me with a grin. “She say, ‘he throws money away and he needs new ship-ship!” We all cracked up. After we had been there an hour or so, we walked back to the car. As we left, groups of men, were still arriving, mostly wearing galabeyas or drab western clothes. More cars had parked right around us, and it was cute to see little Osama, the Ahmed’s youngest son, directing his dad with loud and proud voice as he inched his way backward out of the tight parking place. So that was a “local” wedding. Even today, I treasure the memory, and I am so pleased that I had the opportunity to attend a type of wedding which few westerners have had the opportunity to attend. This entry was posted in Travel Stories on February 2, 2015 by Laviajera1.